Each of your meals can be catered if you wish. A sumptuous spread of delicious innovative and traditional recipes, or dishes of your request. Amanda Craze, is our Property Manager. She may be booked to cook delicious breakfasts using the best locally sourced ingredients. Gather at the table for golden yolked free range eggs, locally sourced bacon and sausages, grilled tomatoes, oven baked buttery mushrooms and, of course, baked beans. Accompanied by orange juice, tea and coffee and followed by toast and preserves. For a change, try a different breakfast menu, such as softly scrambled eggs with succulent smoked salmon or tangy kedgeree flecked with smoked haddock and a dash of cream. 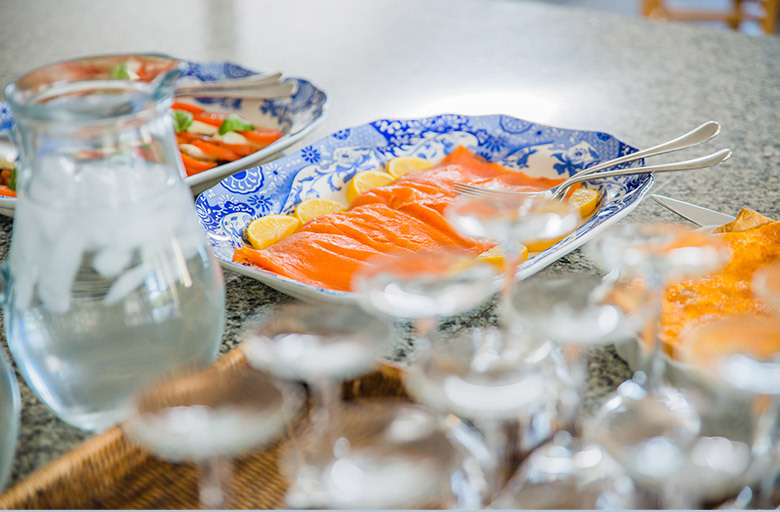 Why not look at our recommended caterers on our Special Event supplier page for a special meal, celebratory BBQ or recovery breakfast? For parties our cocktail mixologists can ensure your glass is always full of your favourite tipple or something exotically new. A little indulgence to make your stay even more special.